Mountains has it’s own set of challenges. We do a lot of hiking into areas you can’t get to any other way, which can be like a ‘needle in the haystack’ when attempting to get on the elk, and hoping they are ‘in the rut’. very effective. Mooney’s don’t want the same reputation as Cessnas, where they can have a bird strike the back window they’re so slow, ha! 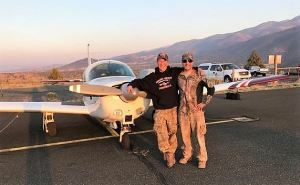 Anyway, using the Mooney to travel across the state of Oregon quickly to get to our hunting area, and then to use for scouting once there, made the experience very efficient and rewarding on many levels. All while burning 9 gal/hr! All that to say, we were not successful for elk this year. We did get in on the elk however, and some years we don’t, which is more like taking your bow for a long walk. We did use the Mooney for deer hunting transportation a couple weeks later as well, and 2 out of our hunting party filled tags – very nice bucks too! See attached for a pic of my brother’s buck. So keep flying fast out there, and sometimes as slow as you can in a Mooney if you’re scouting! For any doubters out there, this is my story using a Mooney hunting, and I wouldn’t have it any other way!